South Pacific Indulgence - 24 day tour! Day 1 - Fly from Los Angeles in the late evening. Day 2 - Cross the International dateline. Day 3 - Arrive in Auckland on the North Island. Private car transfer to the Heritage Hotel Auckland. Your afternoon is at leisure to explore New Zealand's largest city. Day 4 - Private transfer to Huka Lodge via Waitomo Glow Worm Caves. Day 5 - Day of leisure to enjoy this award winning lodge. Day 6 - Private transfer to Rotorua Airport for your flight to Queenstown on the South Island. Private transfer to the Waterfront Hotel. Day 7 - Today visit the breathtaking Fjordland National Park and cruise Milford Sound; motor coach one way / fly one way. Day 8 - A full day jet boat adventure on the Dart River. High speed thrills combined with magnificent Alpine scenery. Day 9 - Private transfer to Queenstown Airport for your flight to Christchurch. A private transfer to the George Hotel. Your evening is at leisure to explore this British influenced city. Day 10 - Day at leisure. Depending upon the season you may want to take an optional, full day Kaikoura whale watch tour! Day 11 - Day at leisure to enjoy the gardens of Christchurch. Day 12 - Private transfer to Christchurch Airport for your flight to Melbourne. Upon arrival, you will be met and transferred by private car to the Luxury Collections Sheraton Southgate Hotel. Day 13 - Day at leisure to explore Australia's second largest city. 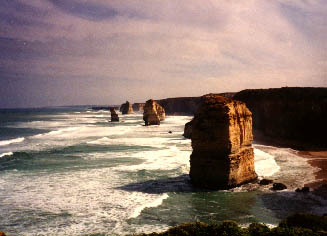 Day 14 - Private tour of the Great Ocean Road and the Twelve Apostles. Day 15 - Private transfer to the airport for your flight to Cairns. Upon arrival, you will be met and transferred by a private car to the Sheraton Mirage Port Douglas. Day 16 - Day at leisure to enjoy this tropical rainforest area. Day 17 - Private transfer to the airport for your flight to Lizard Island. Day 18 - Day at leisure to enjoy this world-renowned resort. Day 19 - Dive, snorkel, fish or just relax and be pampered. Day 20 - Fly from Lizard Island to Sydney. Transfer by private car to the New Sydney Westin Hotel. Day 21 - Full day four-wheel-drive tour of the Blue Mountains, including lunch. Travel the Great Western Highway where you will view the richly forested hills and many rock formations including the Three Sisters. Day 21 - Private tour to enjoy the sights of Sydney. Day 21 - Day at leisure to explore beautiful Sydney, consistently voted the favorite city of international travelers by Conde Naste & Travel & Leisure magazines. Day 24 - Transfer to Sydney Airport for your flight back to the U.S.A.
To Plan your own unforgettable Australian & New Zealand vacation, call us today!